The sooner you can positively determine that you’re losing your hair, the more hair you will likely be able to save. Here are the signs you need to look out for, and an overview of common hair loss treatments. By most estimates approximately 40% of American men start losing their hair before they’ve reached their 40th birthday, while the stats for older guys are even less encouraging. Only one generation ago, there wasn’t much you could do once your hair started to thin. You could either go out and get a wig or expensive hair weave treatment, or wait as long as you could possibly stand witnessing your relentlessly balding dome in the mirror every morning before finally undergoing hair transplant surgery. You had very few, if any, realistic options to be pro-active about your condition. Fortunately, in recent years notable strides have been made towards eradicating the scourge of male pattern baldness (MPB). As such, millenials will probably emerge as the hairiest generation in human history. That said, there’s still no “cure” for MPB. However, there are things you can do that might slow the process down and sometimes even stop it altogether. Just remember, retaining your hair when you have MPB requires a certain amount of vigilance. In order to preserve your locks, you need to keep your eyes open for any early indications that male pattern baldness might be creeping into your life. Because by the time it’s become obvious and you’re finding clumps of hair on your pillow, in your comb, and clogging up the shower drain, you’re already somewhat behind the 8-ball. Put simply, the sooner you can positively determine you’re losing your hair, the more hair you will likely be able to save. Because once your hair has fallen out, it’s never coming back again — not naturally, at least. There are few ways to accurately determine if your hair loss is the result of male pattern baldness and not some temporary factor causing it to fall out. This is what you need to watch for. Almost all guys with MPB start to lose their hair in the same manner. For most men, as their hair loss progresses, the frontal hairline starts forming into an ‘M’ shape as hair recedes from their foreheads. This is because the hairs on the temple and crown are the most sensitive to dihydrotestosterone (DHT), which is the primary chemical culprit behind male pattern baldness. With time the middle of this ‘M’ recedes ever further, resulting in more of a ‘U’ (or horseshoe) shape towards the back of the head. Left untreated, the hair will continue to retreat until the scalp is partially or completely bald. For some guys the crown of their scalps are also susceptible to early hair loss, and as such they can start balding in that area before it becomes apparent at the frontal hairline. To check for this yourself, just stand in front of one mirror while holding another mirror behind your head, the same way your barber or hairdresser might when showing you the results of a haircut they’ve given you. Similarly, you could ask a friend, family member, or your partner to take a few photos of the top of your head, maybe offering their own prognosis on the state of your dome while they’re at it. To accurately gauge if your hairline is receding, all you really need to do is photograph yourself every couple of months. It’s that simple. The only trick is to make sure you always do so under the same lighting conditions so there will be no room for ambiguity should you detect any subtle changes as the months go by. Also, pay attention to any errant hairs you might come across — especially if you’re finding them with any degree of regularity. Check your pillow, your comb, hairbrush, the headrest of your car if you drive, your coat lapel; a certain amount of errant hair is perfectly normal, but if you start finding more of them as time goes on, approximately 15 or 20 hairs at a time, you may well be experiencing the first stages of male pattern baldness. One final thing to consider is: does anyone in your family have a hair loss problem? If they do, while there’s certainly no guarantee you will develop one too, it does become more likely and you need to keep this in mind. By the same token, scientists still don’t know for sure how baldness is inherited, so if you have a bald father, grandfather, brother or uncle, it’s definitely not a given you will suffer the same fate, however, anecdotally, at least, you are at greater risk. Nutritional deficiencies like low protein intake, low iron, basic malnutrition and various deficiencies resulting from eating disorders. Excess vitamin A or selenium in ones diet. Hormonal disorders emanating from the thyroid and/or pituitary glands. A negative reaction to certain hair products and treatments. Some skin disorders like psoriasis and seborrheic dermatitis. Hair follicle and/or fungal infections like ringworm. Certain medical conditions such as diabetes, lupus, anaemia, alopecia areata, and thyroid-related diseases. Medications like ACE inhibitors, anabolic steroids, certain antidepressants and anticonvulsants, retinoids, beta blockers, and anticoagulants. While often mistakenly considered a problem primarily affecting the male population, by the time they reach their 50s and 60s, women are almost as likely as men to see their hair thin, and in some cases, even fall out completely. In fact, according to the American Academy of Dermatology, 40% of women have visible hair loss by age 40, while the North American Menopause Society and other official bodies report almost half of all women will experience hair loss or thinning before age 50 – with the situation often worsening during menopause. 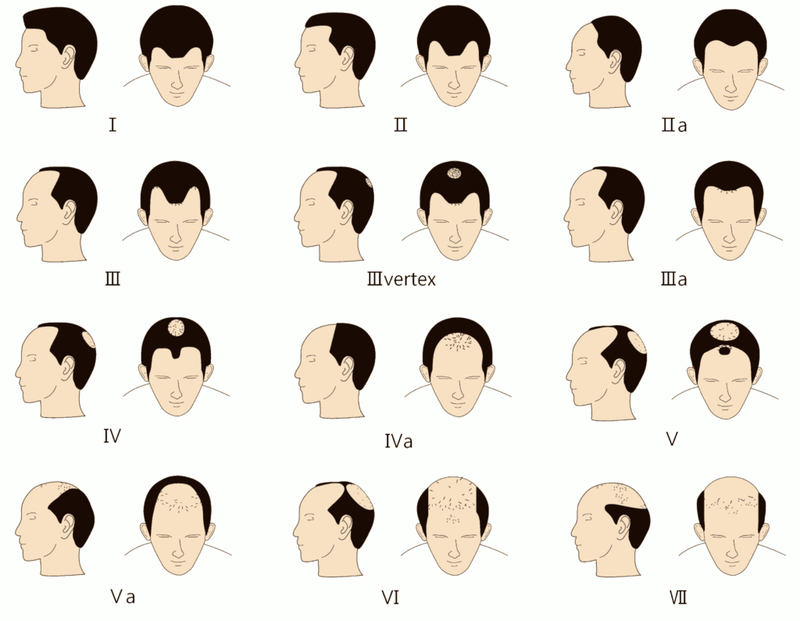 Following this scale, there are seven stages of balding, ranging from no balding whatsoever to completely bald. The further along the Norwood scale you are, the fewer options you have to retain what’s left of your hair. By the time you get to Stage 5, you might as well forget about stop gap measures like Minoxidil or Finasteride treatments. At that point you’re essentially looking at a transplant. Thinning on the top back part of the head. A general thinning over the entire scalp, with little noticeable change to the actual frontal hairline. A slight recession of the frontal hairline. For most, but not all men, their hair loss is barely noticeable at this stage. At this stage there’s no denying you are losing your hair. The frontal hairline has recessions around the temples that may or may not be covered by a thin layer of hair. Some men also start to see thinning or balding around the crown as well. By this point, the recession at the temples has worsened, connecting to form a bridge of hairlessness between them. The front hairline might also have receded far back enough by stage 4 to connect with the now bald crown. A band of hair extending across the top separates the hair loss between the front temporal area and the crown, creating a bridge between the hair-covered areas on the side of the head. By stage 4 it is fully evident you are balding. It’s also when the majority of men start searching for solutions to the problem. By stage 5 the hair loss is considered severe. The hair remaining hair on the scalp becomes thin and continues to recede on all sides. The hair loss has continued to the point where there is far more visible skin than hair everywhere on the scalp. Very little, if any, hair remains by stage 7. Should there be any surviving hair, it is typically found at the very back of the head. If you’ve determined you have MPB and want to fight it, or just want to have your suspicions about going bald or not confirmed or verified, the specific medical doctor to visit is a board-certified dermatologist. At the same time, in light of how many men suffer from the problem, there are many “hair loss specialists” out there, some arguably shady, but many others knowing pretty much all there is to know about male pattern baldness and what can be done to treat it. Your best bet would be to visit a board-certified dermatologist who specializes in hair loss. A dermatologist or specialist will likely use a magnifying tool called a densitometer to inspect your scalp and see if there has been any miniaturization of your hair follicles, possibly ordering you to go for a scalp biopsy. If you’re truly suffering from MPB, it will be pretty apparent to a skilled professional. According to Dr. Pryor, the medications described below can be very effective for some, and not so much for others. Commonly known by the brand name Rogaine, Minoxidil holds the distinction of being the only topically applied hair loss treatment approved by the FDA to date. While it has been proven effective at regrowing hair, nobody truly understands how it works and a lot of skepticism exists about it’s long-term effectiveness. By all accounts, if it works for you at all, and there are no guarantees of this, as soon as you stop applying it the effects will wear off and your hair loss will return to as it was before you started treating it with Minoxidil. Plus, be it by liquid, foam or spray form, Minoxidil needs to be applied twice daily, in the morning and again at night, and for best results should be left on the scalp for 4 hours before being rinsed out. That’s a pretty fair commitment when you stop to think about it. Even by the most generous estimates, approximately only 40% of patients will regrow hair using 5% topical Minoxidil. At first glance this figure still might sound somewhat encouraging, except it doesn’t take into account that these hairs need to be maintained through perpetual, indefinite use of the product. This is because Minoxidil doesn’t address the root cause of MPB, which is DHT (dihydrotestosterone). DHT is an androgen hormone responsible for giving males their male characteristics, including a deeper voice, increased muscle mass, and yes, it determines the resilience of one’s scalp and body hair. Nevertheless, when Minoxidil is used in conjunction with Finasteride (also know as Propecia), the combination has been shown on occasion to produce genuinely impressive results, with some patients experiencing significant, permanent hair regrowth. Still, even when combined with other medications, Minoxidil is not considered a “cure” for hair loss. To summarize, while some patients have experienced truly positive initial results using Minoxidil, for many it has no effect at all and has even been reported to worsen hair loss for some. Also commonly known by the brand name Propecia, this drug has been FDA approved for the treatment of alopecia. Given that under federal law, all FDA approved remedies must have proven their efficacy in multiple clinical trials, as with Minoxidil, you could be forgiven for understanding Finasteride to be an actual cure for hair loss. However, there are several caveats to this assertion. Finasteride is a drug that decreases the conversion of testosterone to DHT, which in turn should prevent hair from falling out in light of what’s currently understood about the role DHT plays in male pattern baldness. But Finasteride has demonstrated varying rates of success for different people. For some it does nothing, whereas for others it has stopped the balding process and even encouraged new hairs to grow. Unfortunately, patients need to wait between 1 and 2 years before being able to accurately judge the effectiveness of Propecia. In one recent study of men aged between 18 and 41, approximately 50% of patients experienced improved hair growth, with their hair being longer and thicker after 1 year of treatment. That number increased to 66% after 2 years of continuous treatment. The treatments were less successful for men between the ages of 42 and 61, however, with only 40% showing improvement after 2 years of taking finasteride. In order to be effective, like Minoxidil, Propecia must be taken on a permanent basis. If discontinued, all the hair it has retained will fall out within 12 months. Finasteride also has no discernible effect on the frontal hairline, but is rather targeted towards the top of the scalp, at the crown. Plus, and perhaps most discouragingly, the drug’s effectiveness has been shown to wear off after 5 years of treatment. Eventually, its positive effects reverse and the balding process starts all over again. PRP is a non-surgical alternative medical procedure used to treat hair loss and thinning which involves injecting the patient’s own blood into the scalp. The theory behind PRP therapy is that our blood plasma contains active growth factors which can promote hair growth. While the results to date are alleged to be very encouraging, as of this writing no clinical trials have yet been conducted to determine the true efficacy of this approach. PRP therapy is also fairly expensive, with sessions typically costing between $500 and $1,000 in the United States. A minimum of 4 sessions are required over the first 4 months of treatment, along with 2 treatment sessions every year after that. “PRP has been shown to be effective and is a treatment utilized in our practice,” confirms Dr. Pryor. These are Dr. Pryor’s final, prescient thoughts on the subject, effectively summarizing the status quo with respect to hair loss and the industry that has emerged to treat the condition. Still, with promising research being conducted into PRP, hair cloning, and even laser-based treatments, there’s hope for the balding.